"Those who see, know, or simply work with Simone Luti, are able to appreciate, beyond his musical talent, his huge human and cultural sensitivity. These are skills which allowed him to get respect and unanimous consents wherever he has been and has worked." LuccaMusica, September 2004. 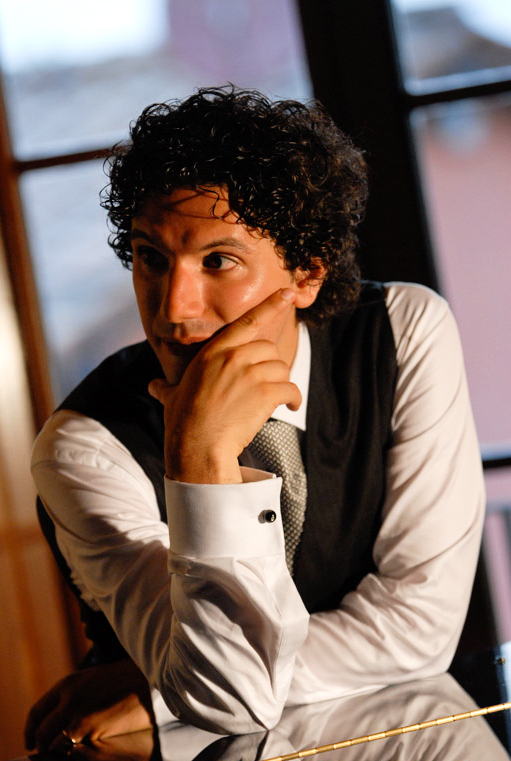 A native of Lucca, Tuscany, orchestral conductor and pianist Simone Luti is quickly gaining recognition and acclaim for his musical instincts and sensitivity on the podium and at the keyboard. He has conducted on the podiums for such organizations as The Musical Festival in Ticino Locarno, Switzerland, in Albania at the Opera Theatre in Tirana, the Symphony Orchestra of Bacau, Romania, and the International Opera Theatre of Philadelphia (in Teatro degli Avvaloranti, Città della Pieve; Teatro Mancinelli, Orvieto; and The University of Performing Arts, Philadelphia). At the keyboard, Mr. Luti has performed as a solo and collaborative pianist in recitals, opera galas, and chamber groups for theatres and musical institutes throughout Italy, Austria, Switzerland, and Belgium, playing. Of note was his debut at the Lucerne Festival playing for soprano Irina Lungu. As part of his musical training, Mr. Luti studied piano with Gloria Belli, Konstantin Bogino and Fabrizio Papi while his formal studies in composition were overseen by Pietro Rigacci. To date, his compositions have been performed in Lucca, Pisa, and Florence to enthusiastic audiences. It was during his compositional studies, however, that his passion for opera blossomed. He went on to earn academic scholarships to study opera, firstly at the Teatro Verdi in Pisa, and afterwards in Milan at the Academy for performing Arts associated with the Teatro della Scala (Accademia d'arti e mestieri dello spettacolo del Teatro alla Scala) getting specialized both in repertoire and music didactics related to opera house. During this time, he studied conducting with Vittorio Parisi at the Academy of Giuseppe Verdi in Milan, and at the Accademia Chigiana in Siena with Gianluigi Gelmetti. In 2002, Mr. Luti began working as musical coach at the Teatro della Scala and the main Italian Theatres, collaborating with the most significant directors, singers, and film directors in the operatic world. He currently lives between Tuscany and Milan, working both at the Teatro della Scala and as a coach at the Academy of the Teatro della Scala. He assists in the opera training courses carried out by Mirella Freni, Luis Alva, and Luciana Serra, devoting himself to the musical training of young opera singers. In May 2009, maestro Luti was invited to participate as conductor and coach of the Canadian Operatic Arts Academy hosted at the University of Western Ontario and its Faculty of Music. He returned to the Academy in 2010 adding to his function by becoming musical director. Following his first residency in Canada, he joined the Summer Opera Workshop of Indiana University in June of 2009 where he once again worked as a coach and gave masterclasses on Italian repertoire. He has also subsequently become musical director of the Indiana University Summer Opera Workshop. Recent engagements took him to Cremona as coach for As.li.co’s productions of Pagliacci, La Voix Humaine, The turn of the screw, Medea e Zauberflote, as chef de chant for Théâtre du Chatelet’s production of Norma, as musical director for American Opera Theater’s production of La Tragédie de Carmen both in Italy and Baltimore, as assistant conductor and coach for Orchestra London’s production of Giulio Cesare, as well as numerous collaborations for recitals and concerts in Italy and abroad. Future engagements include renewed collaborations with the As.li.co’s association in Cremona, Le Chatelet, American Opera Theater (Dido & Ænæs and Madama Butterfly). In January 2011 he joined the Opera de Montreal as a coach, for a special collaboration with the Atelier Lyrique.